The property provides a modern warehouse with 2 storey offices, car parking and loading areas and following extensive refurbishment meets the following specification: The building is of steel portal frame construction and is accessed via 12 ground level loading doors, new roof cladding and new roof lights, eaves height of approximately 8.25m. The 2 storey offices are provided with WCs, kitchen facilities and benefit from suspended ceilings and lighting, heating and raised floors. Externally, the building has extensive car parking to front and large secure rear yard. 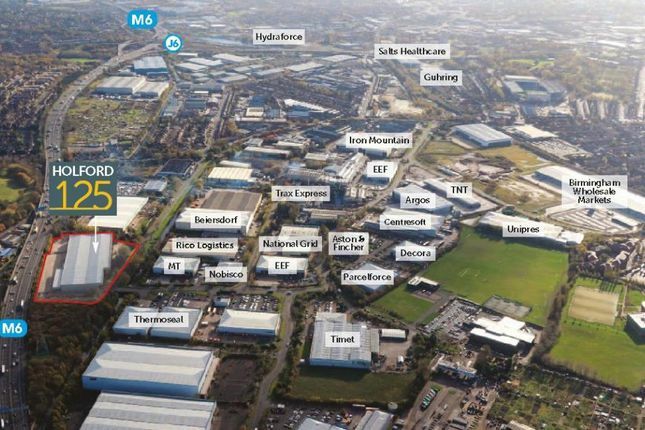 The unit is situated on Tameside Drive on the popular Holford Industrial Park, approximately 3 miles north of Birmingham City Centre. Holford is an established industrial/warehouse location due to its close proximity to Junction 6 of the M6 motorway, approximately 1.5 miles to the South East, linking in turn with the M5, M42, M40 and National Motorway Network.